Uzumba Maramba Pfungwe district is on high alert following a recent cholera outbreak that has left two people dead and 66 admitted in Mt Darwin. Speaking to 263Chat, UMP District Administrator Douglas Hungwa said there is a lot of inter district trading between Mt Darwin, Rushinga and UMP hence the risk of the disease spreading to their area. "As a district we are on high alert when it comes to the cholera outbreak,as you are aware that we share a common boarder with Mashonaland Central and there is a lot of inter district trading between Mt Darwin, Rushinga and UMP," he said. Hungwa however said their current stocks are enough to contain an outbreak should it affect their area. "The District Medical Officer has promised us that there are enough stocks in terms of drugs in the event of any outbreak. "We are also monitoring the situation on the ground considering that we also have artisanal miners especially along the Mazowe river where sanitation facilities are not up to scratch so we are on high alert," said Hungwa. 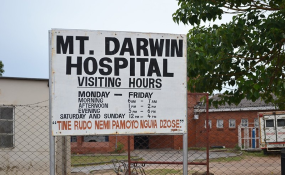 More than 66 people have been admitted at Mt Darwin District Hospital after testing positive to the waterborne disease. According to the World Health Organisation, key risk factors for cholera in Zimbabwe include the deterioration of sanitary and health infrastructure and increasing rural-urban migration which further strains the water and sanitation infrastructure. In Harare, contaminated water from boreholes and wells is suspected to be the source of the outbreak.